I had just been asked where I was and I was trying to reply with Ranger School, but the word school eluded me. As the instructor continued to ask me questions, I began to realize just how much mental capacity I’d lost. Aside from the word Ranger, which was more muscle memory at this point than reasoned thought, I couldn’t figure out where I was. No phase of Ranger School is a joke, but the mountain phase in the winter can be especially brutal. We had been in a security holt for hours; laying on the frozen ground pulling security. I only know that it had been hours because it had been hours before the numbness had set in. There’s no way of knowing how long we were really there. I followed the instructor to a set of rucksacks and was surprised to find that nobody was there. The instructor pointed to the next set of lonely rucksacks and asked if I saw them. I told him that I did and he instructed me to walk the perimeter until we were ready to move again. Luckily, I had only succumbed to a mild case of hypothermia before they caught me. But with winter coming up, a stranded vehicle or power outage can provide the perfect situation for a severe case of hypothermia to set in. What I have always loved about military training is the fact that every single detail of it is there for a reason. Every skill mastered and every question asked has a purpose. Do you know why the Ranger Instructor asked Jason: “Where are you now?”. Having in mind the whole situation he was in, it looks like the most inappropriate question you can ask a person who is maybe freezing to death. BUT! If you ever get into the situation to evaluate whether or not someone is hypothermic, please, ask him the same question! Do you know why? That is the hardest and the best question in the world you can ask someone whose body temperature is approaching dangerously low level. Read on, Jason just described the experience of hypothermia, and I’m here to explain the science behind it. Combined, those two points of view can make a difference between life and death in certain situations. Oh, I will reveal to you later why is so ingenious the question Ranger Instructor asked Jason. Just like almost all other mammals, humans are warm-blooded animals. I said almost for a reason. The Arctic ground squirrel can drop the body core temperature down to 26.5° F (-3.0° C) without freezing solid! A number of mammals are not quite warm-blooded. What we perceive as cold is the absence of heat. Our bodies continuously produce and lose heat. To keep the body temperature within the physiological range (97°-99°F) the process or production and the energy loss needs to be balanced. Once the body starts to lose more energy than it produces, the temperature drops. – The person affected by mild hypothermia feels cold and shivers. – Hands, nose, ears and other exposed parts of the body may appear cyanotic. – Although alert, the person may have difficulty speaking, he or she is well aware of the situation. – Since the person can take care of him or herself and the body’s functions are preserved, passive warming is all that’s needed. Applying dry clothes to achieve better insulation, and or moving to a warmer environment (indoor or some other kind of shelter) is enough. Run or perform some static exercises to increase the energy production. – The chances for a successful rescue are the best during this stage. In case you haven’t found a way to preserve the body energy, it’s better to keep looking for help than just waiting and hoping for the best. – Loss of coordination and precise motor control (person becomes sloppy). – Lips become bluish, cyanotic. – The person can not take care of him or herself and needs guidance. The body temperature is critically low, and clearly, the body can not make up the energy loss. Active warming is necessary. Passive warming may help, but establishing the external source of heat is a priority now. – In cases like this, internal rewarming is necessary. Using warm humidified air, heated IV fluids and the irrigation of body cavities with warm fluids are some of the standard procedures. – Without specialized medical team and equipment, successful reanimation is not likely. – The pulse, heartbeats, blood pressure, and breathing are not detectable. This condition is known as “vita minima” and even for a trained health professional can be challenging to decide whether or not the person is alive. – Just like severe hypothermia, it requires specialized medical care. Spontaneous recovery is not likely. What is so ingenious about the question Ranger Instructor asked? The Instructor wanted to find out whether or not Jason is in hypothermia and if he is, to evaluate the stage of it. – The instructor decides to remove the weapon from Jason’s hands (loss of coordination and precise motor control combined with mental confusion). Even if he could pull the trigger, he wasn’t capable of making a valid decision about shooting necessity. – Walk in place (passive warming). In the absence of better solutions, passive warming attempted- even if it doesn’t resolve the issue, it will certainly buy some time. Can you diagnose the stage of hypothermia now? If you thought of moderate stage, you were right! Although Jason believes it was a case of mild hypothermia, what he experienced was a moderate stage hypothermia. If you ever get into the situation to evaluate someone’s hypothermia level, determining the mental status is the most important step in the triage. – Do not drink alcohol and/or coffee to warm up. Those will dilate the blood vessels in the skin and speed up the loss of body temperature. – Wet clothing and/or wind on subzero temperatures are your worst enemies! Stay dry no matter what! – Always keep a blanket and a wax candle in your car during winter. – Do not let the person in hypothermia fall asleep. Keep them awake as long as you can. So I guess my self-assessment was a bit off. 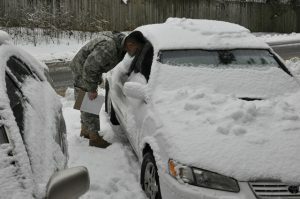 But when you’re stationed at Fort Drum, N.Y., shivering is a natural state of being for about 10 months out of the year. It’s when you stop shivering that we start to get worried. It’s hard to self-assess cognitive capacity (particularly in situations like the one you experienced). Also, it is entirely a subjective estimation, therefore not suitable for a decision-making algorithm that should be easy to apply in emergency situations (combat for example). The shivering is much easier to interpret: Shivers- ok. No shivers- not ok.